There is good news and there is bad news: the good news is that the low price VPS market is very competitive, providers are pushing hundreds of VPS plans, many of them with impressive specs. Prices seem to always get lower. Just look at how DigitalOcean, Linode, Vultr and others have created $5 plans in the past year that include 1GB of memory. That was unheard of just 2 years ago. The bad news is that, for the same price and specifications, some of those VPS are blazingly fast while others are painfully chugging along. Fortunately, VpsBenchmarks spent thousands of hours testing 25 VPS providers and 60 plans. We figured out which ones perform the best for $10 or less per month and all this information is available here. We're not setting up a ranking where a single plan is number one and every other plan has a lower unique rank, that would be assuming everyone has the same needs, and this is not the reality. Instead, we report a list of VPS plans, each one graded in five categories. The categories are web, disk IO, network IO performance, raw CPU power and performance stability. 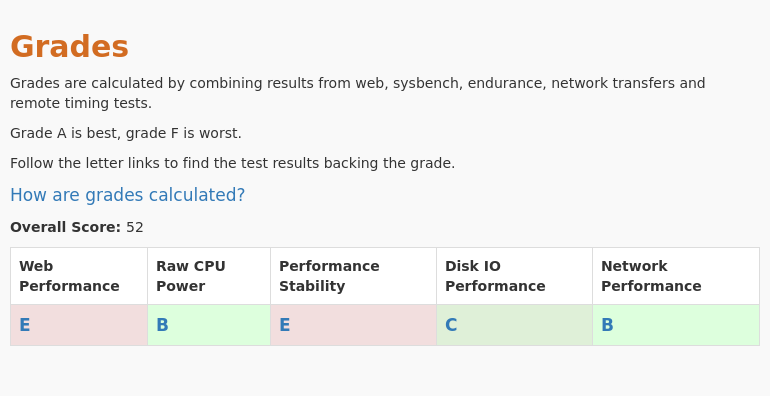 All grades is backed by our web, sysbench, endurance and remote test results that you can see by following the grade letter links in each plan and each category. None of the test results was paid for or influenced by any of the providers. 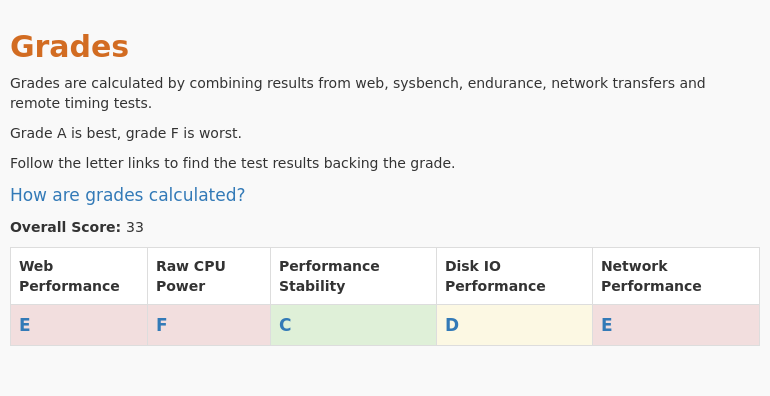 To decide which grade is the most relevant for you, you must know your needs: if you're running a web server, you will be most interested in the web performance and stability grades. If you're crunching numbers, the raw cpu power is what you should pay attention to. Do you do intensive disk IO or network IO? Check the appropriate grades. And of course, the official specs of the VPS matter too, you want a VPS that has enough memory, enough disk space and enough CPU to run your application. All of those plan characteristics are reported, along with the performance grades, in the list below. You can go very far with just $10 per month, several providers offer more than 2 CPU cores and 2GB memory for that price. However, be careful about the specs advertised by the providers, they don't tell the whole story: for the same specs, some of them can go twice as fast as others. There are several possible reasons for that: some plans come with one CPU core while another gives you two. But it could also be because the slow provider over-allocates its machines and squeezes more VMs than its competitors on the same hardware. The VPS plans in the list below all have two things in common, they cost $10 or less and they're unmanaged. They are sorted by their overall performance, the fastest is at the top of the list. If you have a bigger budget or want to filter the list using other attributes such as memory or disk space, simply go to the VPS Screener, it allows you to change those parameters and more. The list will vary as we test more plans or update the tests for existing plans. Come back often to get fresh data! As of April 2018, our favorites in the $10 or less VPS category are Vpsdime, Upcloud, Ramnode and Hetzner. Ramnode is the absolute fastest, the only problem is that it only gives you 1GB memory for $10. 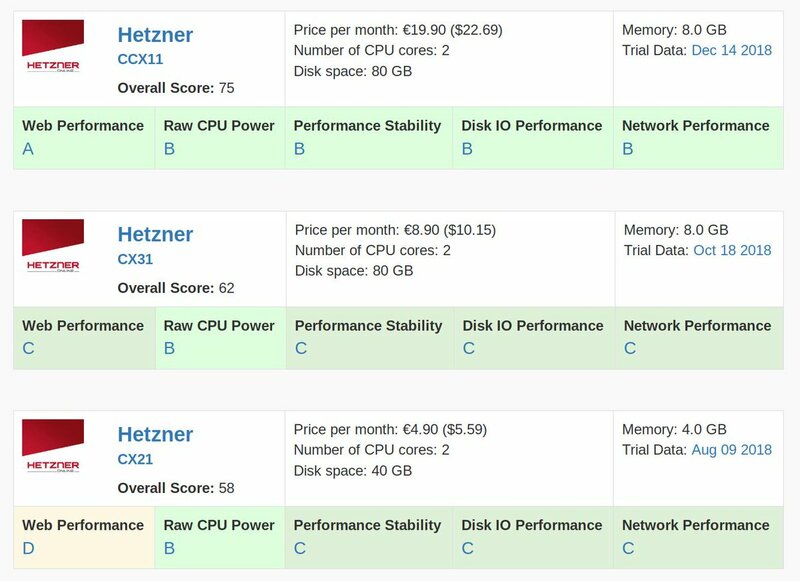 If the price is the most important factor in your decision, go with Hetzner CX21 or OVH VPS SSD 1. OVH is the cheapest and it is fast enough but their convoluted website makes for a poor user experience. Hetzner at $6 is a good choice with the right specs, performance and simple UI but it only has datacenters in Germany which means serving a website from there will appear slow to US visitors. Vpsdime is a nice and well-balanced option, it's inexpensive at $7, it includes the most CPU and memory of all contenders and performs really well. Check their terms of service before you sign up though. Upcloud is a bit more expensive, but it has an excellent UI and good performance. The specs for their $10 plan have been raised since the last test we ran: the $10 VPS now comes with 2GB memory and 50GB disk. In the end you'll have to make your own choice based on your needs. Hopefully the grades below will make it easier. Move the sliders or type a provider name substring to filter the VPS list. VpsBenchmarks is only online thanks to Cloud Server providers who support it financially. Even though all providers are tested the same way, plans of Featured Providers are displayed first in this list. Cloud Providers, check out our pricing page and sign up.